American chemist Chad Mirkin, the laureate of the RUSNANOPRIZE 2016, explained RIA Novosti how his nanoparticles will open the age of genetic medicine, may help women get rid of wrinkles and bring us closer to defeating cancer, as well as assured us that the nanomachine-related Apocalypse is a thing of science fiction or deep future. 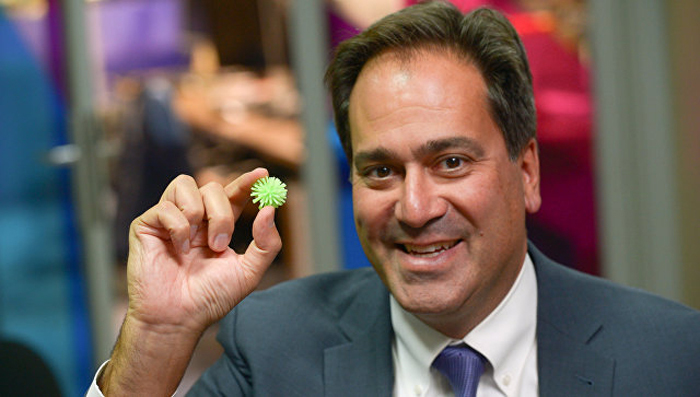 Chad Mirkin is one of the most renowned American chemists, he’s the foremost expert on spherical DNA and RNA molecules and their combination with metal nanoparticles and other inorganic materials. Apart from ‘organic’ DNA nanoparticles, Mirkin and his team at Northwestern University near Chicago have developed ways of making and printing nanostructures on surfaces for applications in electronics and optics. Mirkin was considered to be one of the top contenders for the Nobel Prize in chemistry in 2013 by the Thomson Reuters bureau and many other experts and has been a contender ever since. He was also nominated in the past for the RUSNANOPRIZE, which is awarded by the Russian nanotech company RUSNANO for development of nanotechnologies and their practical applications since 2009. — Chad, the geneticists often face a huge backlash by the society and the politicians when they work on DNA editing technologies, such as CRISPR, as well as GMO products. Somehow, nanoparticle research avoided all that; can you explain why did that happen? — In this case, I think, there’s a fundamental difference between nanoparticle research and GMO research.In the case of nanomaterials, we deal with a subset of chemical research, in which we try to find new and useful properties of different materials that are purely artificial and a consequence of miniaturization. Every bulk material when miniaturized is different. Gold is not gold in color when made on the nanoscale—it is red. This is why the field is so exciting. Everything becomes new and different when miniaturized, and those differences can be used to develop many new technologies. On the other hand, DNA editing and GMO production is a technique, performed using well-defined biochemical processes and they involve permanently manipulating living organisms. This creates ethical considerations and has drawn the attention of regulators and people concerned about long-term consequences to life itself. Of course, there are people who are afraid of nanotechnologies, but it’s really hard and unfair for them to paint all nanotechnologies with the same brush and claim that all of them are bad or good by definition. If you think of it, many things that were created in science in recent years can be called ‘nanotech’ in one way or another. After all, many molecules, the product of chemistry, are smaller than the building blocks and structures we refer to as nanomaterials. For example, the structures we are working with should not be classified as nanoparticles—it is too general of a term. They are, as we call them, spherical nucleic acids, a completely new type of nano- and chemical structure, which we can be created by coating specific metallic structures with short strands of DNA or RNA, which allows us to generate particles of pre-determined size, shape and function. There’s nothing like them in nature, yet they interact with living matter and cells in unusual and useful ways. They are a triumph of the convergence of chemistry, biology and nanoscience. — You were once named as a likely candidate to receive a Nobel prize for your research in the are of DNA nanotechnology. This year it was awarded to a trio of scientists who worked on nanomachines. What do you think about it? — Well, this time it was awarded for discoveries that have nothing to do with our research. Feringa, Sauvage and Fraser Stoddart—my colleague at Northwerstern, by the way—created the building blocks from which crude molecular machines can be created. These nanomachines replicate in a simplistic manner what macroscale machines or machine parts like rotors and switches can do. So, yes, you can say that this year’s Nobel Prize went to nanotech research, but you have to understand that nanotechnology is very vast, and it covers so many things, spanning energy research, electronics, optics and medicine. In this particular case, our research is in a completely different category from what this year’s Nobel Prize winners were doing. If we talk about me personally, I have no answer for you—it’s not up to me to decide who and when they should get the Nobel Prize, let’s leave that for the Nobel Prize committee. — At the Nobel Prize press-conference, Ben Feringa was asked if the nanomachines pose any threat to humanity now or in the future. He told the reporters that he thinks they won’t ever be a credible threat for us. Do you think that is true? — Again, if we look closely at this year’s Nobel Prize, we’ll see that it was awarded for a very fundamental discovery. I think that we are now at a very early phase of chemical nanotechnology, and far away from the types of machines that science fiction writers invoke as entities that could cause the extinction of life on Earth in the infamous ‘grey goo’ scenario. The idea that nanomachines are being built that could rebel is a product of science fiction that has little to do with the actual science. I think this idea will remain in that field of thought for a long time to come. The nanomachines that we have now are really crude demonstrations that can’t do anything functional on their own. Generally speaking, they are not the nano-Terminator devices that some propose will cause problems for humanity. In my opinion, decades, if not centuries, will pass before we have to discuss this problem on a serious level, if at all. — In which areas of nanotechnologies do you expect the most progress to happen in the nearest future? — First, our spherical nucleic acids are being widely used in medicine and the life science industry. Some of them are already used for medical diagnostics in clinics and hospitals—for example, spherical nucleic acids with gold nanoparticle cores are used as labels for the very precise and fast search of specific DNA sequences, proteins and other types of molecules associated with disease in biological samples. These particles can be used to detect viruses, bacteria or cancer cells in samples of saliva, blood or urine, as well as determining if a patient is genetically predisposed to a specific type of disease. This is all already implemented in practice. Much more awaits us in the future. We are now creating a new kind of spherical nucleic acid that can be filled with other types of molecules, and these particles can infiltrate into cells and tissues like no other DNA or RNA molecules can. For example, we can add those nanoparticles to a kind of cream that you can rub into your skin and that cream can be used to address more than 200 types of genetic diseases that afflict skin cells and tissues. In the same way, we can create medicines that alleviate irritable bowel syndrome in the colon, macular degeneration and other diseases of the eye, or problems with the lungs or bladder. In other words, we are now on the brink of the age of genetic medicine. It’s really important to understand that you need three things to make that dream come true. First, we need robust ways of creating and designing DNA and RNA molecules. We learned how to do that about 30 years ago. Second, we need to understand why this or that mutation in a specific gene causes a particular disease. We have this information from the Human Genome Project and related efforts. The third thing—the ability to get DNA to the place in the body where you need it—was eluding us until this moment. As it happened, spherical nucleic acids are perfect for that—now we can target any organ or any tissue in the body, and not only the liver like all other methods of gene regulation therapies. We don’t even have to make our particles tissue specific because we can directly and topically apply them to the afflicted organ. — Some time ago you managed to turn DNA into crystals. Have you found any practical application for such crystals? — If there was a Nobel Prize in this area, I’d say that the methods for making such crystals would qualify. We got interested with spherical nucleic acids back in 1996 for reasons that had nothing to do with medicine or biology. We had introduced the concept that you can view nanoparticles as atoms and DNA as a programmable bond and developed the design rules to assemble them into a multitude of crystalline forms. We can mix and match different particles and build crystals with extraordinary complexity from the bottom up. We can control the placement of all these ‘atoms’ with sub-nanometer precision using the power of DNA bonds. It turned out that it paved the way for an entire new field of materials science, and now we can build materials that we want by designing them to have the properties we desire instead of relying only on what nature offers. Today we have designed nanoparticles that have allowed us to create over 500 different types of crystals, six of which do not even exist in nature. Why is that interesting? Thanks to the diversity of the nanoparticles we have created, the number of such combinations is nearly infinite as well as the new properties that can be realized. Although the practical side of this aspect of spherical nucleic acid research is a decade off, we believe these crystals will be the route to new types of designer catalysts and optical materials and devices that control light in ways we’ve never seen before. — When you created spherical DNAs, you said that it can be possibly used for cosmetic purposes, i.e. wrinkles removal. Did any of the cosmetics companies contact you? — Yes, many corporations approached us. The potential of the spherical nucleic acids is nearly limitless from the cosmetic standpoint—we can use them to make the skin more elastic, we can use them to remove dark spots in the skin by forcing cells to stop the production of the pigment molecules that make skin go dark, as well as to do many other things. However, there’s a problem—it’s not clear how such products will be regulated. They can be viewed as either cosmetics, pharmaceuticals or cosmeceuticals, and it’s not clear how their safety will be tested. In addition to that, from a business standpoint and from a health standpoint, the development of cosmetic nanoparticles gives way to disease and cancer research, which is much more important for us and patients than wrinkles or other cosmetic problems. — In the recent years scientists published hundreds, if not thousands of papers devoted to this or another ‘material of the future’, for example, plasmonics or DNA origami. In time, they sort of ‘evaporated’ and we don’t really hear about those ‘wonder’ materials anymore. Why does it happen? — In fact, I would not say that all such research evaporated—both plasmonics and origami research are still going strong, although it’s probably safe to say that origami in the short term will remain purely a fundamental kind of science. But who knows what will happen 30 years from now? Just remember the story of lasers. When scientists first created lasers, someone said, as far as I remember: “this is an interesting discovery that is looking for a use”. Decades later, lasers are everywhere—you can see lasers when you check out your groceries in the supermarket, they are used for conducting surgery in hospitals, each computer and communication system has at least one of them. In other words, sometimes a fundamental kind of discovery takes not only months or years, but decades before it finds its practical and commercial use.